This Thursday, November 19, hundreds of enthusiastic and kind hearted individuals are going to storm the Fairmont Empress Hotel, baubles in hand, to launch this year’s BC Children’s Hospital Festival of Trees. The festival is one of the many events held annually by the BC Children’s Hospital Foundation to raise funds and awareness for BC Children’s Hospital. 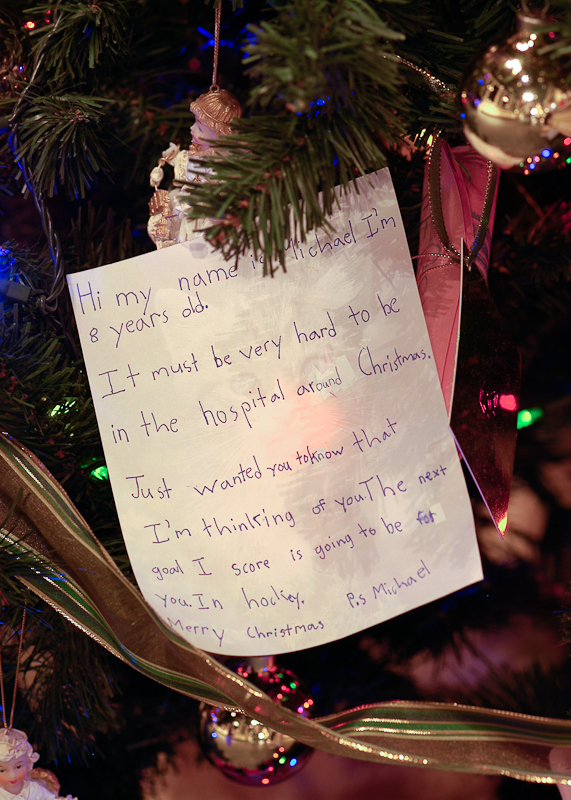 Funds raised through the Festival of Trees help ensure BC’s children receive the best health care possible. In 2008 alone, more than 2,500 children from Vancouver Island were admitted into BC Children’s Hospital to receive care and treatment. Local businesses and organizations donate to the foundation to sponsor a tree and, on November 19th, will gather their friends, families and employees to help decorate their tree in the halls of the Fairmont Empress Hotel. During the two-hour scramble, teams put together ornate, unique, and creative trees that they hope will win them the peoples choice award. Teams also have the opportunity to bribe judges with cash and toys for a chance at the coveted judges’ award. Thousands of Festival visitors will have the opportunity to cast a vote for their favorite tree with a two-dollar donation. With each vote they are entered into a draw for the People’s Choice Award Citizen Prize. With over 9,000 votes and 69 trees, last year’s Festival of Trees proved to be the biggest and best year yet as the event raised a record $105,327. Additional money is raised via sponsors’ registration fees, bribing of the judges, donations, and by purchasing ornaments for the community tree. Now in its 18th year, the Festival has grown to feature up to 75 trees. This is our 9th year sponsoring this event. It is an absolute must-see for anyone with children. The staff and management of the Fairmont Empress have donated their time, resources, beautiful facility and so much more for 18 years, allowing 100 per cent of the funds raised to go directly to the foundation. This is my favorite charity event of the year. Not to diminish the importance of any of the others that I support, but Festival of Trees is guaranteed to launch our hearts into a generous holiday spirit. In 1986 I lost a nephew to a drowning accident in the interior. He was air lifted to BCCH and in spite of the amazing attention and care given to him, the injuries he sustained were too serious and he passed away. The tears in the eyes of the nurse across the bed and the compassion from all the staff members still lives with me. It dawned on me, on the eve of my 53rd birthday, that I’ve been shooting professionally for 16 years and that the most fulfilling times for me artistically were 16 years ago, and again 5 weeks ago. Sixteen years ago, the experience was fulfilling because I didn’t know what I was doing. All I knew was that I had to learn something different so that I wouldn’t have to go back to the life that I had left. I would learn f-stops, apertures, and ASAs if it killed me. Focal lengths and depths of field would haunt me until I woke up from a blurred nightmare. And during that time of shooting like a mad man, I felt like a kid. I was trying everything: shooting at night, during the day, fast shutters, slow shutters, standing on my head, holding my breath. As a result of my ignorance, I created the 3 most important photographs in my life. All where shot in Guatemala with available light. All include my kids (none of which will ever be deemed to be kid photos) and all were shot in black and white. No confusing elements like colour to confound what I was feeling. The best part? I walked out of the lab of Ange Buorda (a friend and mentor) with a paper print in my hand. Not a CD. Fast-forward 16 years, and I am a commercial shooter in Victoria surrounded by digital cameras, computers and monitors. Yes it’s still photography, but something is missing. It’s not that I miss the smell of developer and fix, but the nature of the workflow has changed. For commercial work, digital photography is brilliant but I noticed earlier this year that I actually was missing going to the lab every day. I was starting to feel that my role as a photographer was becoming that of a technician, not an artist. Back in July, I took the Stinking Fish Studio Tour in Metchosin, and met an artist named Chiarina Loggia: an intriguing woman, with an intriguing story, and an intriguing way of turning a photograph into an original piece of art. I love her work. She explained that by taking a digital file and printing to a black and white transparency, she could transfer the image to a light sensitive plate that she would ink and press into a fine art print. Not rocket science apparently to some, but it was news to me. What really inspired me was that her work was captured electronically but manipulated using traditional techniques into something that expressed so much emotion. Until then the only means by which I was aware of to come even close (not even close) to what she was creating was with a computer. To me, that didn’t count. And so I took her course. I felt as elated as I had 16 years ago. To witness the reveal from underneath her press felt exactly like watching my first black and white image appear in a tray of developer. The results killed me. The image originally was, in its own right, a laboriously created photograph; one that I would have been satisfied with had the process ended there. What made it a nostalgic experience was taking that image and transforming it, (getting my hands dirty in the process) and creating an original, unique, piece of art. The black and white etching at the top of this page is what I created, with Chiarina’s help, from my color photograph above it. The Stinking Fish fall studio tour happens November 27th to 29th. You don’t want to miss it. For workshop dates, contact Chiarina. Welcome to the birth of my first blog. Did you hear that? No… that wasn’t the sound of a hand on a newborn bum, it was the sound of a young boot on my very old rear end. Blogging is something that I’ve been aware of for years and have been uninterested in for about the same amount of time. It seemed to be an online version of a person sitting in the corner of a coffee shop, scribbling into an elastic bound bunch of papers while nursing a very cold, decaf, non-fat somethingorother. I would have no part in it. Leave it for the bored and self-absorbed. But after reading a number of new generation bloggers, I’ve come to understand that they can be a valuable resource of relevant and specific information. And as much as I would like to argue that change is bad, because I don’t want to, I concede that the way that we view and share knowledge today is about to stand the world on it’s head. So this won’t be about me. It will be about what I do for a living, what I do for a hobby, what I do when I’m awake and what I do when I’m asleep. It will be about photography. Not necessarily how to do it, but rather how photography has, and will continue to change the way we view the world and ourselves. It will be about something that is so much more than a flimsy print of a bored child taken on a ridiculously colored velvet background. Or, Imagine how impactful a verbal description of “her green eyes” would have been, had National Geographic photographer, Steve McCurry not grabbed that shot of the direct and piercing gaze of the mysterious Afghan girl through those green eyes. An image that would make it’s way into the top 100 pictures of National Geographic. Remember Marilyn Monroe? Remember the image of her dress being sent aloft by a gust from an air vent? Of course you do! Do you think you would remember it, had you never seen it? And, I won’t bring up 9/11. Photography, whether we realize it or not, influences us in ways that we may never fully understand. Consider your passport, your drivers license, your grad photos, your wedding photos, your vacation photos, your x-rays, Google Earth, spy planes, telephoto lenses, paparazzi. My blogs will not always speak directly about photography. Rather, they may tell about an event or cause that interests me because of what I do. Or they may be about a project that I am involved in, that without photographs would be about as interesting as a verbal description of the color of a sunset. And, in fairness, given that this is what I do for a living, they may be about any one of my clients who have used my imagery to convey their special message to the world. If you end up enjoying this blog, thank my friend and assistant, Laura Scotten. That was her boot that you heard.